Melbourne’s infamously changeable weather has kept the outdoor recreation fraternity on constant guard lest there be a sudden onslaught that takes them by surprise, and unprepared as it flattens all before it. And today, the Melbourne Delta Force Paintball centre at Dingley was grateful they are always ready. It wasn’t dark skies and the threat of high, destructive winds that had these experienced paintball professionals bracing themselves however, but a storm of another kind. The Melbourne Storm. With a total of 14 Melbourne Storm players selected for rugby league’s upcoming representative weekend, the Storm will be represented in the Australian, New Zealand, Samoan, NSW City and U20 sides. They may have been born during the tumultuous 1998 season but this is a team that has made serious impact from then through to the current day. This is a team of stars, a team of commitment to excellence, a team that accepts no substitutes or excuses, and these are the reasons Matt Ford, the Melbourne Storm NRL squad trainer brought the guys to Delta Force Paintball Dingley for a team building day today. The Delta Force Paintball centre at Dingley is well equipped and experienced with dealing with high profile sports teams that beat a path to the amazing movie-quality game zones to enjoy a day of structured, morale boosting and team bonding so important to a winning side. 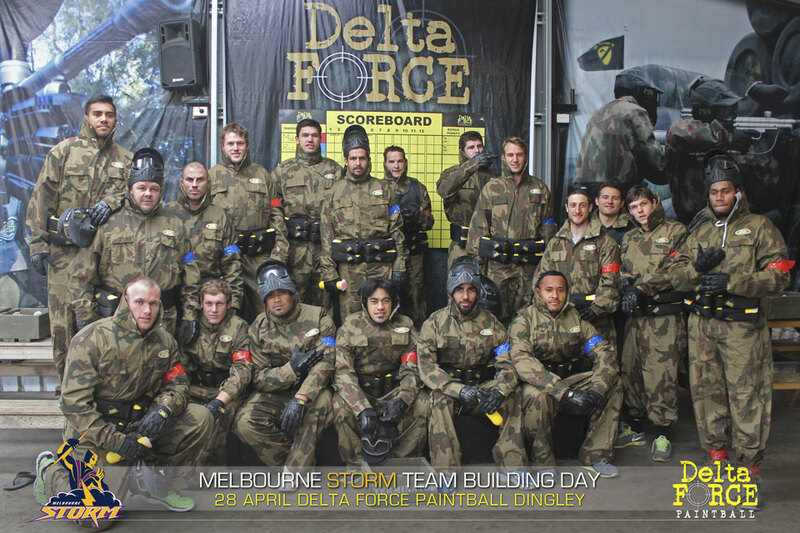 The real life military aircraft, tanks, missile installations, and wild west gold rush provided a multitude of challenges and scenarios for the Melbourne Storm players as they applied their craft of football to the game of paintball. George Rose, like all his team mates, fought bravely against being given the target vest, but drew the short straw and found himself conspicuously in the crosshairs of his team mates more often than not, and as a result, the big front row prop found himself in the thick of the action most of the day. 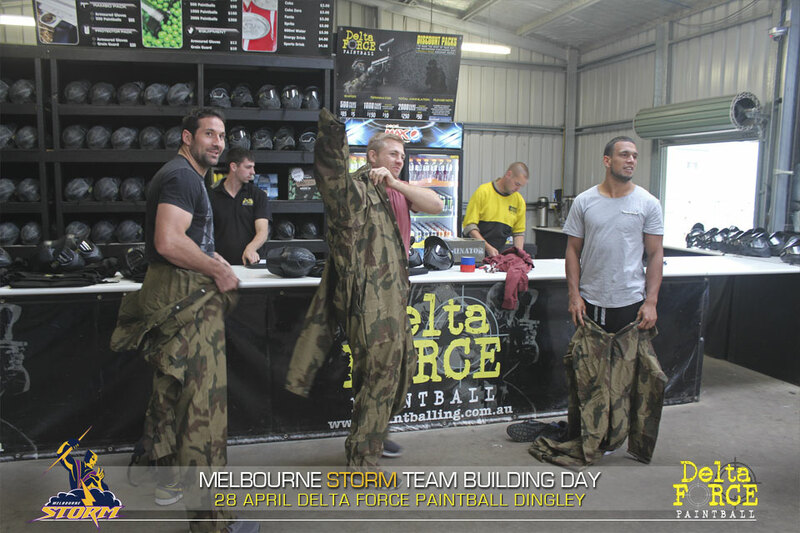 The real purpose for the Melbourne Storm squad present today at Delta Force Paintball Dingley was to provide a moral boosting, team cohesion building day between the yet to prove themselves players such as Hunt, Robinson, Lodge, Walker, Kaufusi, Mann, Weston and Rose and the established players like Fonua, Waqi, Moors, Hinchcliffe, Chambers, Norrie, Garbutt and Glasby. If the smiles on the sweaty faces and the sworn oaths to return and play with Delta Force Paintball again are anything to go by, it would seem the day was highly successful in more ways than one.